Tennis | Khelmart.org | It's all about Sports. This tennis racket is specially developed for beginner. Racket material is aluminum which is lightweight in nature and offer better durability and strength. Racket head shape is around 81 Sq Inch which gives better sweet spot so that player can get more area to place powerful shots. Novak 21 Tennis racket is developed for beginner players. Racket is made of Aluminium material which is lightweight in nature and offers great durability for beginner level tennis players. This tennis racket is suitable for those kid players who just started the Tennis game and try to use best racket as per all round type of game need. 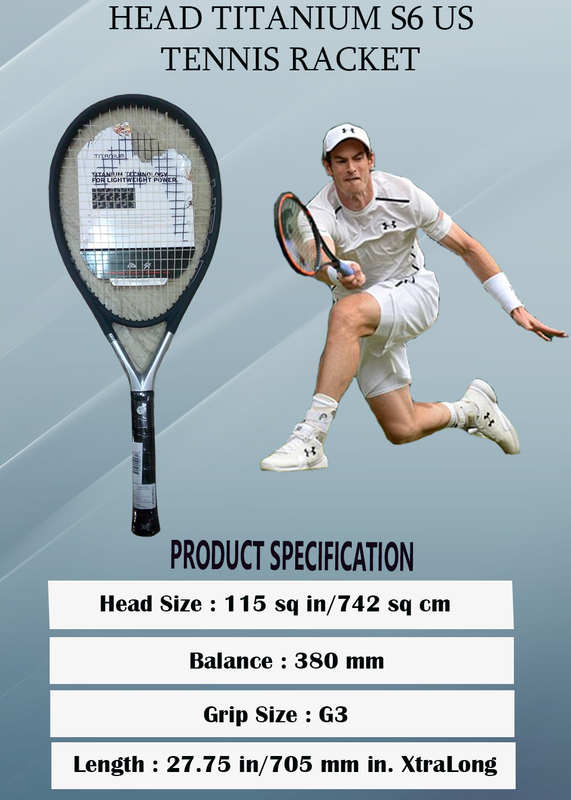 Racket head size is around 87 mm which gives best string bed area for beginner level players. The US Open 23 features a Titanium technology that is lightweight and strong. This racquet is ideal for a 5-7 year old. The 95 sq. inch head features a large sweetspot and packs plenty of power. This racquet is made tough so don’t worry if little Johnny decides to hit it against a pole. Features a comfortable small grip that is perfect for small hands. Frame of this racquet is made of Aluminium which gives light weight configuration and enables players to perfectly execute the backhand and forehand shots. Wilson US Open 21 is basic tennis racquet designed for entry level junior tennis players. 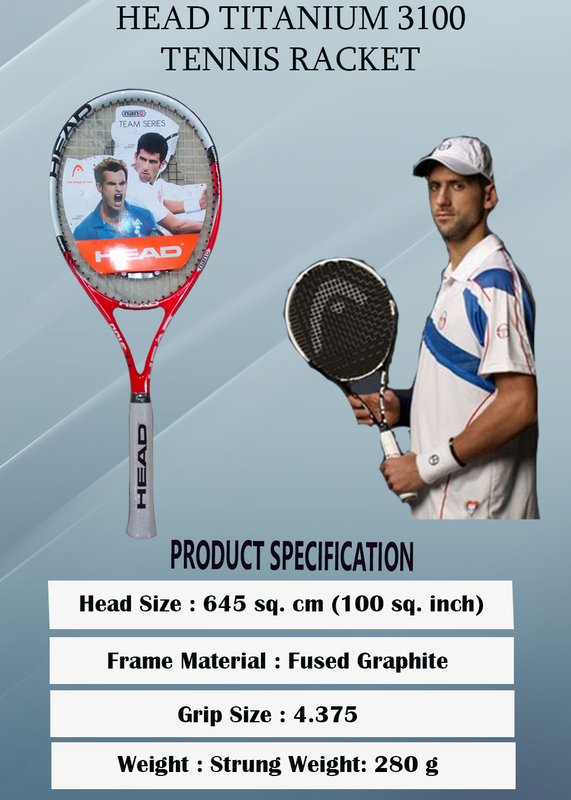 Racquet is made of aluminium material which is a lightweight material with durable in performance. Wilson US Open 21 Tennis Racquet is constructed with C-Beam Technology which gives uniform load distribution across the racquet frame for better feel and performance. With US Open 21, players can start the Tennis game and acquire the basic knowledge of tennis. Head size of US Open 21 is 95 Sq Inch while racquet length is 21 Inch. With these specifications, Wilson US Open 21 is referred as basic but effective tennis racquet for junior players. With advance technology, racquet weight is kept minimum .i.e. 173 gms only. HEAD Tennis produces state of art Tennis equipments for professional and amateur players. Head Tennis rackets are used by world’s top seed tennis players. With latest technologies and innovative material science, Head manufactured superior quality tennis rackets. Head TI (Titanium series) tennis rackets are designed for advance tennis players are equipped with latest material technology. In this blog we shall explain the best in class Head Titanium series rackets. Head Titanium 3000 Tennis Racquet is a medium powered racquet that offers a good control. The racquet body is made from fused graphite material along with O-Beam construction and a 22 mm frame.The 100 sq.in racquet head gives a large sweet spot. The Titanium 3000 is designed with shock absorbing technology that absorbs the vibrations when produced and this improves the quality and accuracy of the shorts. The racquet allows for fast strokes with ease. The racquet is ideal for senior players who play at intermediate level. The Head Titanium 3000 is also suitable for recreational players. 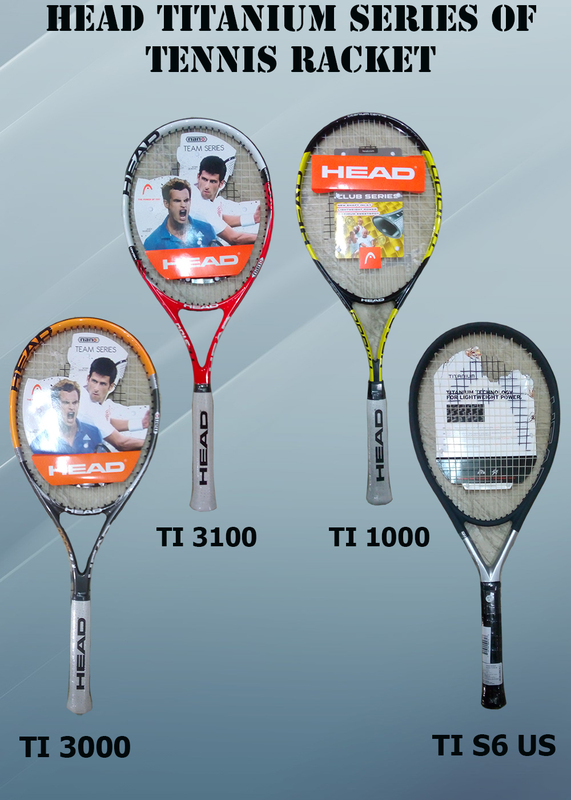 Head Titanium 3100 Tennis Racquet is an advance version of Ti 3100. Titanium 3100 Tennis Racquet is equipped with damping technology which helps to reduce the shocks absorption from hard hits and players get easily to play the shots on court. This racquet is best suitable for intermediate players. Head size of tennis racquet is 100 square inch it will give you a large sweet spot and player will get more comfort on playing shots. This racquet has good power and good control. With 18X19 string patterns, Titanium 3100 gives more string to center of string bed. This tennis racquet frame is designed with fused graphite material and weight is 280 gms. The Head Titanium 1000 is a great choice for those on a budget looking for a basic racquet to get them started in tennis. The racquet features a all new shaft inlay for enhanced stability and a longer length for more power. The racquet has balanced power and control This racquet is suitable for entry level players. Head TI S6 US is designed for Intermediate player. As per the need to intermediate player , Head putted best technology to develop the racquet. This racquet consists of shock-stop technology which is basically reduces the vibration 90% faster as compare to conventional one. Frame material is kept as stiffer to give more power on shots while with G3 grip will give you good racquet Handling. With 115 Sq Inch racquet head and titanium graphite-body , TI S6 US will provide destroying power. Light Weigh tennis racquet always useful for quick swing and fast shots. TI S6 US is developed with light weight frame design to give you quick racquet speed and swing. TI S6 US is a pre strung racquet with 16X19 string pattern. Graphics & colours of TI S6 US will suits your style and complement overall tennis player look. In this blog we have listed latest shoes of Wilson Tennis Bags. After reading this blog buyers can easily take a wise decision and easily check the product specification. We have putted all the features of tennis bags, buyers can easily check the tennis bags according to his/her need. Wilson Tour 6 PK Tennis Bag can securely carry up to 6 racquets conveniently on your shoulder with its adjustable, padded and removable shoulder strap. This tennis bag is made with high quality material which will provide you long lasting and durable product. This Kit bag is equipped with large flat side pocket to hold accessories with inside zip compartment to hold smaller items and large tunnel side accessible pocket to hold shoes and apparel – This Tennis Bag is good for keeping shoes and dirty clothes separate from other equipment. Dimension of this tennis bag is 77 x 27 x 35cm. Wilson Australian Open Triple Kit Bag carries your racquet conveniently with its adjustable single straps. This tennis bag is made with high quality material which will provide you long lasting and durable product. Dimension of this tennis bag is 74 x 32 x 12cm. Wilson Tour 9 PK Tennis Bag is better designed kitbag. This kitbag comes in color black and red which will give you different look on Tennis court. Wilson kitbag is equipped both of side compartment. This Tennis Kit bag comes with Two X-Large Main compartments with curved openings that allow players to easily access equipment and Thermo guard compartment – Thermo guard: Protects equipment against extreme temperatures as well as to help maintain the rackets string tension. This Kit bag is equipped with large flat side pocket to hold accessories with inside zip compartment to hold smaller items and large tunnel side accessible pocket to hold shoes and apparel – you can store your racquet strings, towel and other accessories. Dimension of this tennis bag is 30 x 14 x 14 inch. Wilson Tour 9 PK Tennis Bag is better designed kitbag. This kitbag comes in color black and silver which will give you different look on Tennis court. Wilson kitbag is equipped both of side compartment. This Tennis Kit bag comes with Two X-Large Main compartments with curved openings that allow players to easily access equipment and Thermo guard compartment – Thermo guard: Protects equipment against extreme temperatures as well as to help maintain the rackets string tension. This Kit bag is equipped with large flat side pocket to hold accessories with inside zip compartment to hold smaller items and large tunnel side accessible pocket to hold shoes and apparel – you can store your racquet strings, towel and other accessories. Dimension of this tennis bag is 30 x 14 x 14 inch. Wilson Team 6 PK Tennis Bag can securely carry up to 6 racquets conveniently on your shoulder with its adjustable strap. This tennis bag is made with high quality material which will provide you long lasting and durable product. It is equipped with one pocket. Dimension of this tennis bag is 78 x 32 x 21cm. Wilson BLX Team 6x Tennis Bag can securely carry up to 6 racquets conveniently on your shoulder with its adjustable strap. This tennis bag is made with high quality material which will provide you long lasting and durable product. This Kit bag is equipped with large flat side pocket to hold accessories with inside zip compartment to hold smaller items and large tunnel side accessible pocket to hold shoes and apparel. In this blog we shall compare the best 5 tennis racquets of popular brand Babloat (Babloat Aero Pro Team Tennis racquet, Babloat Aero Pro Drive Tennis Racquet, Babloat Contact Tour Tennis Racquet, Babloat Pure drive Tennis Racquet and Babloat XS 102 tennis racquet). This blog will help tennis players in identifying the technical difference in these tennis racquets. Moreover, it will be give you a clear picture of tennis racquets on different technical parameters. Buyers can take wise decision after reading this blog. Babloat Aero Pro Team Tennis Racquet Aeropro team tennis racquet is specially designed for players who like more flexible and lighter weight tennis racquets. Babloat Company added the new features in the tennis racquets while graphics and design are very excellent. Babloat AEROPRO TEAM is equipped with the cortex damping system and GT technology. This technology helps in reducing the vibration of the tennis racquets and helps the player so that they can easily play the game and GT technology used for extra stability at ball impact. Babloat Contact Tour Tennis Racquet This Babloat contact tour tennis racquet is perfect for innovative players and for those who wants to improve and change their game. Babloat tennis racquet is a lighter weight racquet and it is very effective for players to change their direction of cricket ball as per the requirement of the game. The damping system reduces the tennis racquet vibration and players can play shot easily and with great comfort. Babloat Pure Drive Tennis Racquet Babolat Company launched the update version of the tennis racquet named as babolat pure drive; fans are very interested to try that racquet. The new feature of tennis racquet is Cortex Damping System it will reduce the tennis racquet vibration and will provide excellent comfortable for tennis players. This technology gives the perfect shots and extra control on shots. Player will enjoy the game with this new cortex technology which will helps in improving their game. The Cortex Technology is most effective for players and it gives the comfort level feel every player. Babloat Xs 102 Tennis Racquet In the Babloat tennis racquets the XS stands for Xtra Sweetspot and this will allow you to hit more powerful tennis shots. This tennis racquet is light weight racquet. Babloat XS-102 tennis racquet provides a damping effect and a longer contact time between the ball and string. BABLOAT XS-102 uses a new pebax plastic material at the sides of the frame these string gives you a larger sweetspot and additional power with more string interaction in frame of racquet. Head Size 100 sq. in. 100 sq. in. 105 sq. in. 100 sq. in. 102 sq. in. In this blog we shall compare the 5 best selling tennis racquets of popular brand Wilson (Wilson Nemessis Power Tennis Racquet, Wilson Envy 100L Tennis Racquet, Wilson Pro Staff 100LS Tennis Racquet, Wilson Pro Staff 90 Tennis Racquet and Wilson Federer Pro 105 Tennis Racquet). This blog will help tennis players in identifying the technical difference in these tennis racquets. Moreover, it will be give you a clear picture of tennis racquets on different technical parameters. Buyers can take wise decision after reading this blog. Wilson Nemessis Power 110 Tennis Racquet The Wilson Nemessis Power 110 Tennis Racquet is best suited for aggressive players. It is equipped with BLX and Double holes technology which will provide you enhanced feel and larger sweet spot area. Head size of tennis racquet is 110 square inch and length size is 27inch. With 16X19 dynamic string patterns, Extreme Lite gives more string to center of string bed. It is equipped with large sweet spot which allows hitting the ball comfortably. Wilson Envy 100L Tennis Racquet The Wilson Envy 100L tennis racquet is very light and fast tennis racquets. Wilson envy 100L is best suited tennis racquet for beginners. It is equipped with Basalt fibers which will give you a clean and comfortable ride, it also provide nice balance between power and control. This Light weight tennis racquets always provide you some nice power and spin. Head size of tennis racquet is 100 square inch and length of tennis racquet is 27inch. This tennis racquet power level is low-medium and swing speed is medium-fast. Wilson Pro Staff 100LS Tennis Racquet The Wilson pro staff 100LS tennis racquet is a lighter and faster tennis racquet. Wilson pro staff 100LS is best suited for intermediate level player. It is equipped with BLX, Amplifeel and Spin effect technology which will provide you vibration resistance, comfortable handel and swing speed. Head size of tennis racquet is 100 sq. in. and length is 27.25 inch. This tennis racquet power level is low-medium and swing speed is medium-fast. Wilson Pro Staff 90 Tennis Racquet The Wilson pro staff 90 tennis racquet is specially designed for advance players. Wilson pro staff tennis racquet endorsed by Roger Federer. This Racquet head size is 90 square inch it will provide you best control and stability. Racquet weight is strung-12.5 oz it gives the ability to hit powerful shots and stability. Swing weight of this racquet is 325 and swing speed is fast. With 16X19 dynamic string patterns, Extreme Lite gives more string to center of string bed. It is equipped with large sweet spot which allows hitting the ball comfortably. Wilson Federer Pro 105 Tennis Racquet The Wilson Federer Pro 105 is a good beginner racquet offering good power, with an enhanced sweetspot. This racquet head size is 105 sq. in. which will provide you best control and stability. Racquet weight is strung-9.9 oz it gives the ability to hit powerful shots and stability. Swing weight of this racquet is 290 and swing speed is fast. With 16X19 dynamic string patterns, Extreme Lite gives more string to center of string bed. It is equipped with large sweet spot which allows hitting the ball comfortably. In this blog we shall compare the best 5 tennis racquets of popular brands (Head Tennis Racquet, Babloat Tennis racquet, Wilson tennis Racquet, Yonex Tennis Racquet and Prince Tennis Racquet). This blog will help tennis players in identifying the technical difference in these tennis racquets. Moreover, it will be give you a clear picture of tennis racquets on different technical parameters. Buyers can take wise decision after reading this blog. Head Graphene Radical Pro Tennis Racquet This Racket is designed with Graphene technology which gives best weight distribution to racket tip and Handle area. With optimized weight distribution, player will get better control and speed. Graphene Radical Pro is the heaviest model in the line, which allows hitting a heavy ball and aggressive players plays the shots from all area of the court. With 16X19 string patterns, Graphene Radical Pro gives more string to center of string bed. Graphene Radical Pro use the world’s lightest and strongest materials, which Racquet head allows to redistribute the frame weight for optimal handling and increased power. Babloat Aero Pro Tennis Racquet Babolat Aero Drive tennis racquets are specially designed for innovative players this is the advance version of the tennis racquet. Advantage of this tennis racquet is Aero Modular Technology it allows for a more aerodynamic frame. This aero modular technology can increase up to the speed of Babloat tennis racquet about 15%. Increased Speed of Racquet helps in generating more power and spin, lot of air resistance still allows player to keep the racquet under control. Wilson Pro Staff 90 Tennis Racquet The Wilson pro staff 90 tennis racquet is specially designed for advance players. Wilson pro staff tennis racquet endorsed by Roger Federer. 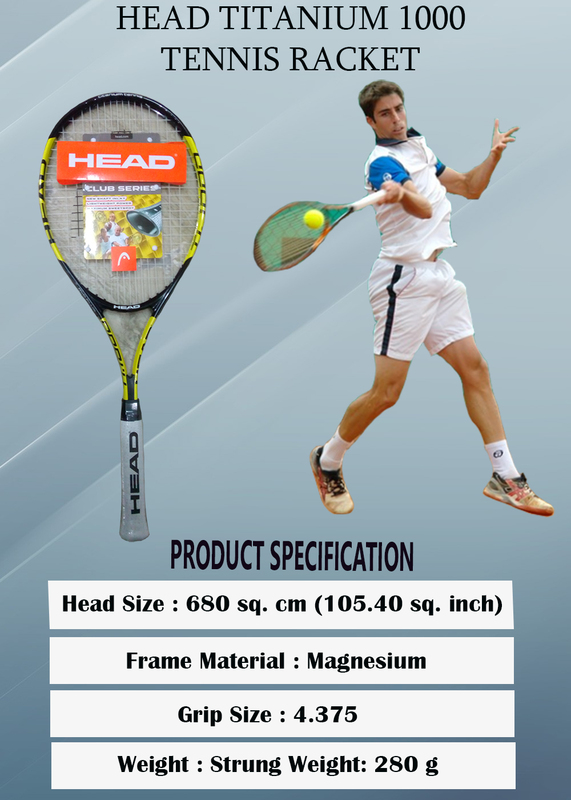 This Racquet head size is 90 square inch it will provide you best control and stability. WILSON PRO STAFF 90 gives more string to center of string bed. It is equipped with large sweet spot which allows hitting the ball comfortably. Yonex Vcore 95 D Tennis Racquet Yonex Tennis Rackets VCORE 95 D of choice for Lleyton Hewitt, the V-Core 95D provides plenty of pop and easy access to pace. From the baseline we found it easy to hit powerful, penetrating groundstrokes. The stringbed offers excellent bite for both topspin and slice, enabling the player to hit powerful shots yet still find ample control. The response from this racquet is somewhat dampened with an emphasis on smooth and comfortable as opposed to all out feel at contact. At net the racquet feels fast and easy to get around thanks to its head light balance. Again, power is impressive which allows the player to punch volleys away with ease. Prince EX 03 Tour 100 Tennis Racquet EXO3 Tour 100 16X18 , With its open 16×18 string pattern, this version of the EXO3 Tour provides a livelier response from all areas of the court. A plush and more generous feeling sweetspot adds some additional pop and easy access to depth compared to the 18×20 version. From the baseline, players will find exceptional access to spin thanks to the extremely maneuverable feel and grippy, open string pattern. In this blog we shall compare the two Tennis racquets of popular brand (Head Youtek Graphene Radical S and Wilson Pro Staff 95 S). Mainly we will compare the Wilson Pro Staff 95 S vs Head Graphene Radical S. This blog will help tennis players in indentifying the technical different in these two racquets. Moreover, it will give you a clear picture of racquet performance on different technical parameters. Buyers can take wise decision after reading this blog. 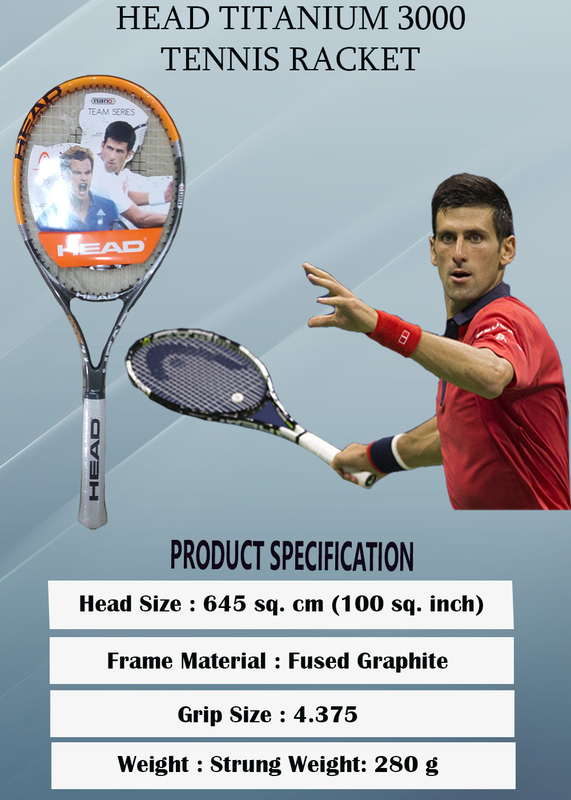 Head Size (inch) 102 95 We observe that Head Graphene Radical S tennis racquet size is 7inch big than Wilson Pro Staff 95 S tennis racquet.Greater Head Size will provide Tennis Player more power on stroke. Length (inch) 27 27 Both tennis racquet length sizes are same. Weight (gm) 315 278 Head Graphene Radical S tennis racquet weight is 37gm more than Wilson Pro Staff 95 S tennis racquet. It is observed that Head Graphene Radical S Tennis Racquet Will give you more racquet swing and it will give you better strength. Balance (cm) 33.4 32.2 Head Graphene Radical S tennis racquet balance is 6% more than Wilson Pro Staff 95 S tennis racquet. It is observed that Head Graphene Radical S tennis Racquet will give you more control and stability on shots. Swingweight (cm) 309 300 Head Graphene Radical S tennis racquet swingweight is 3% more than Wilson Pro Staff 95 S tennis racquet. It is observed that Head Graphene Radical S Tennis Racquet Will give you more racquet swing and it will give you better speed. Flex (RDC) 63 65 Wilson Pro Staff 95 S tennis racquet flex is 6% more than Head Graphene Radical S tennis racquet. It is observed that Wilson Pro Staff 95 S tennis racquet will give you better flexibility on shots. Vibration (HZ) 149 147 Wilson Pro Staff 95 S tennis racquet is 1% less vibration than. It is observed that Wilson Pro Staff 95 S tennis racquet gives you more control with accurate shot delivery. Twistweight (cm) 13.2 14.6 We observe that Wilson Pro Staff 95 S tennis racquet Twist weight is 10% more than Head Graphene Radical S tennis racquet. This Racket is designed with Graphene technology which gives best weight distribution to racket tip and Handle area. With optimized weight distribution, player will get better control and speed. Graphene Radical S tennis racquets are always use for strong players which will enjoy the game comfortably and control on shots. Graphene Radical S model racquet gives you a larger sweet spot which will help you in court to play the shots with more power. Head size of this tennis racquet is 102 square inch; it can be provide a nice platform for blocking the ball back.